Today we are going to dissect David Lynch- a dealer of dreams, a merchant of mysteries and moods, a fanciful gentleman with the great wave on his head, and above all, an artist who never shies away from showing hideousness of human nature. In this session, we will focus on integral organs of Lynchian body. Today we are going to dissect David Lynch- a dealer of dreams, a merchant of mysteries and moods, a fanciful gentleman with the great wave on his head, and above all, an artist who never shies away from showing hideousness of human nature. In this session, we will focus on integral organs of Lynchian body. This is going to be bloody, and when I say bloody, I mean it. If you are squeamish, I reckon you should stop right here, ‘cause I don’t want my room stinkin’ with your barf, that’s for sure. 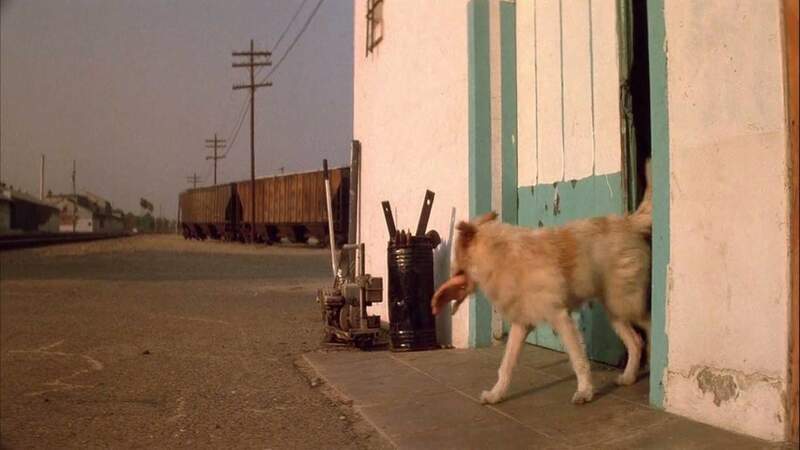 But if you want to peep into something you shouldn’t be seeing, if you want to say hello to the mystery man, in short, if you’re a true fan of Lynch, jump like a rabbit and enter the Red Room where my dog barks some. 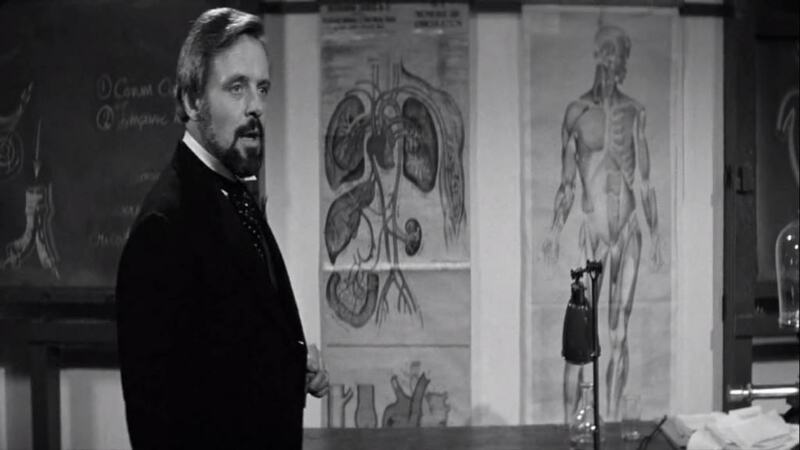 Lynch’s obsession with disembodied organs is evident in his very first short film. This four minute long animated film can be best described as a torrent of nausea. 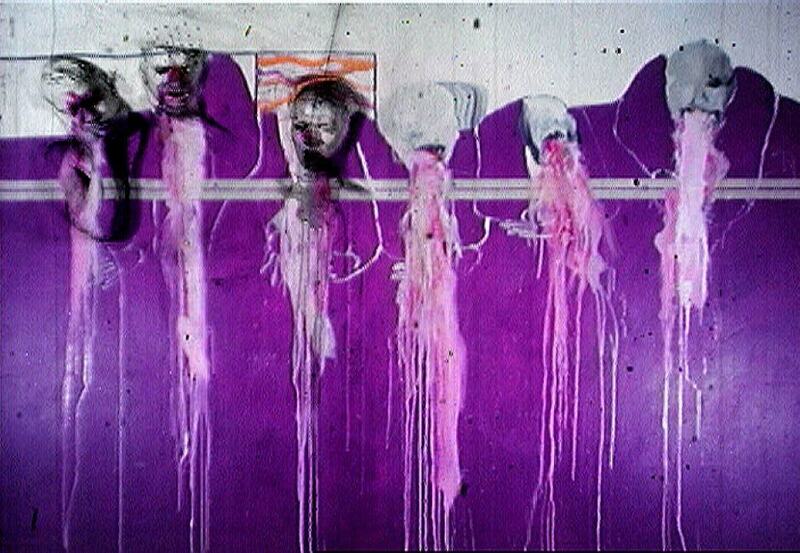 Six ghostly heads floating above disembodied stomachs engage in a puke-fest, as stomachs grow upset. The alarming ambulance siren plays in background throughout the film. Even in his premature work, Lynch leaves an impression on viewers with his artistic sensibilities. The ear is not only starting point, but a central element in this neo-noir thriller. In an iconic opening scene, young Jeffrey finds a severed ear crawling with insects, covered in mud, on the beautiful lawn in picket fences. 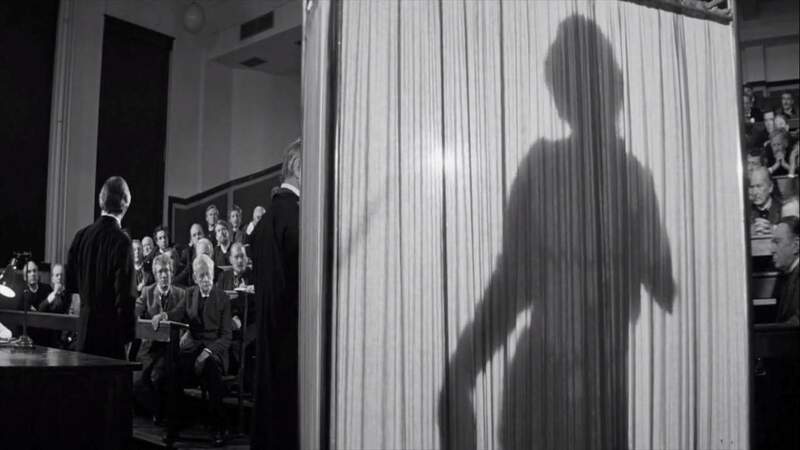 The contrast between luminous façade and its dark side is the recurring theme in filmography of Lynch. This scene is a symbolic representation of ugly side of America lurking beneath picket fences. In Blue Velvet, the ear is not merely a prop, but a character and root of all troubles if you ask me. 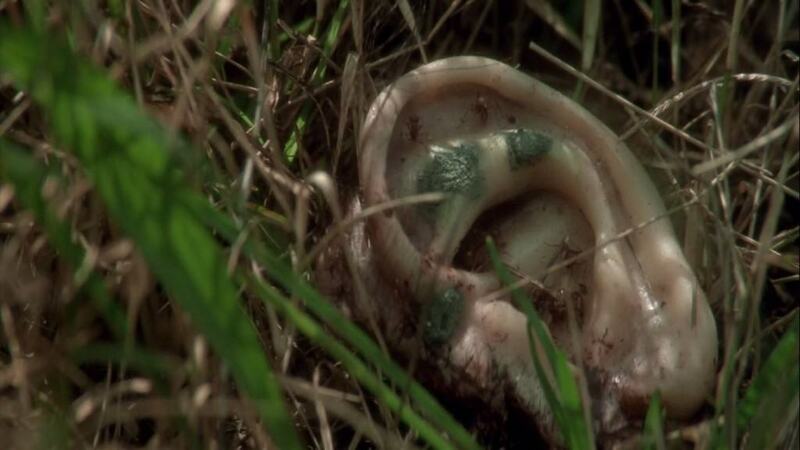 Lynch was so obsessed with this prosthetic ear that it made reappearance in one episode of his celebrated TV series Twin Peaks. In this wild trip down the yellow brick road, the wicked witch of East is not the only threat to Sailor and Lula, as she has hired a black angel named Bobby Peru. Sailor agrees to help Bobby in a bank robbery so that he can start afresh with Lula. Despite its graphic violence, this bank robbery scene is sadistically funny to an extent. After multiple gun fires, the man at counter searches for the hand he just lost, while a dog is seen carrying it out in its mouth. The fierce hitman surrounded by police accidently blows his head off. Here too, hand plays an important role. The film starts with Sailor killing a man with his bare hands in self-defense. Sailor resists against Lula’s evil horny mother. Lula warns Sailor to stay away from Bobby Peru. In the end, the whole movie is about a hand that kills, a hand that warns, and hand that resists. Lynch returns to the wonderful and strange world of Twin Peaks with a prequel movie. An FBI agent mysteriously disappears while solving the murder case of Teresa Banks, whose arm went completely numb in her last days. Mike used to be partner in crime with Killer Bob, but eventually, he cuts off his arm in repentance. The man from another place is the strangest and most iconic of all Lynchian characters. 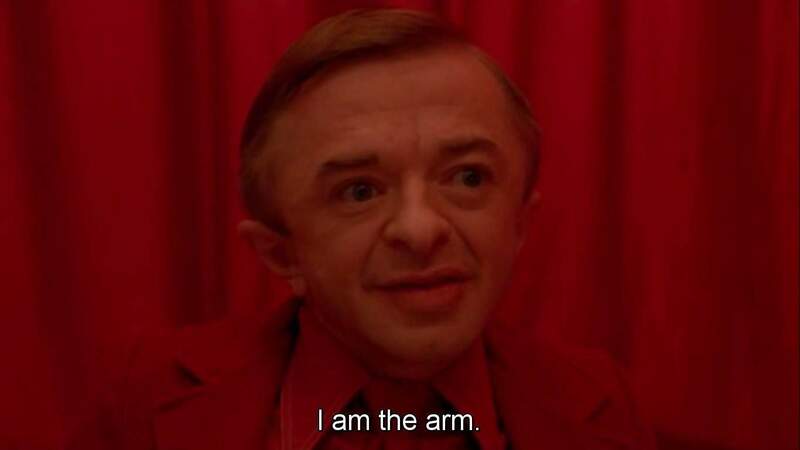 For he is, in fact, an arm of a spirit from the black lodge that exists only within dreams of agent Cooper. In each dream, this eccentric red dwarf provides Cooper with indirect clues that bring him closer to the killer of Laura Palmer. 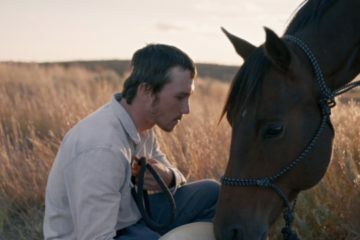 The film itself exists as a symbol of strength, a sort of arm for TV series. This biopic exists as an Elephant in disfigured and disembodied filmography of Lynch. A Victorian surgeon unveils John Merrick, the most perverted and degraded version of human being. Due to extreme enlargement of skull, dysfunctional upper limb and alarming curvature of spine he is named ‘The Elephant Man’ is often treated as a creature in the circus. It is perhaps the most humane film Lynch has ever made, which shows that within ugly and preposterous cage of flesh and bone, there resides a beautiful soul. Mulholland Drive is the perfect example of an organ assuming the identity of its own, devoid of body. In the famous night club scene, the host keeps repeating phrase ‘No hay banda!’ (There is no band), and yet we hear the live orchestra. The audience is well aware of the fact that they are listening to pre-recorded music. Even when singer on the stage collapses, music continues. This is what Žižek describes as an organ without body. Here, disembodied vocal chords depict the undead voice. In The Straight Story, Lynch pours his heart out. This heartwarming road movie is a pleasant surprise coming from Lynch. An old veteran travels 240 miles to visit his ill brother. You can not help yourself but root for the well-being of Alvin during his last lap of the journey which sounds horrible given the fact he had to travel through hills with his lawnmower. The climax is brilliant and nothing manipulative to make you emotional by long philosophical dialogues. It is simple, straight and plain but still very moving. A couple in the big house finds the fresh supplies of their own surveillance videotapes at the door every morning. If that weren’t mysterious enough, the husband finds himself brutally killing his wife without his knowledge. Her legs are torn apart from the torso. He sits there covered in the blood, amidst dismantled organs of his wife. It seems appropriate to associate legs with Lost Highway, for the protagonist is on a run for most of the time. The biggest achievement of Lost Highway is introducing The Mystery Man, the most Lynchian character. In Inland Empire, the handheld DV camera works like an eye with its own subjectivity. Lynch’s ultimate head-trip follows a bizarre odyssey of a Hollywood actress, starring in a remake of an unfinished Polish drama, one struck by some kind of curse. Viewers are confronted with ambiguous oscillation between various versions of her. Close-ups of crying women often appear on the screen. In one shocking scene, Nikki admits that she gauged a man’s eye out in a self-defense. Despite its Hollywood setting, Inland Empire is essentially about a woman in peril. Lynch’s debut feature film Eraserhead is the most nightmarish cinematic experience one can imagine. In one of the most shocking scene, the head of protagonist falls from the sky and lands on the ground. A boy grabs and takes it to what appears like a pencil factory. The pencil machine operator takes a piece of Henry’s head and makes erasers out of it, to be attached at the end of pencils. 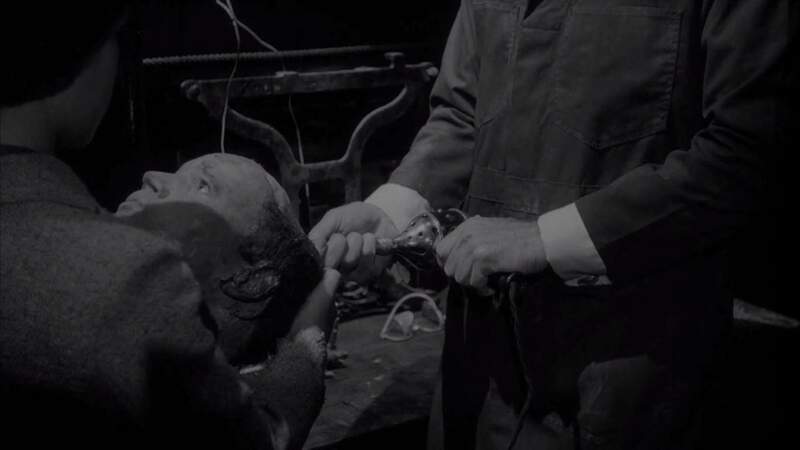 Eraserhead is indeed head of Lynchian body.